The Excel and Word templates are stored in ".xlsx" and ".docx" formats and can be used with the newer versions of Microsoft Office that support the XML document standard (files with .xlsx/.docx extensions - Office 2007, 2010, 2013, 2016 & Office 365). If you have one of the older versions of Microsoft Office that only supports the ".xls"/".doc" formats (Office 2000, 2002/XP & 2003), or if you don't have Microsoft Office installed, use Microsoft Office Online or one of the Microsoft Office alternatives FreeOffice, LibreOffice, Google Docs and others, which are all free of charge (OpenOffice unfortunately has formatting problems when opening our calendars). Also compatible with Microsoft Office for Mac (macOS) and Microsoft Office mobile for iPad/iOS, Android and Windows 10 mobile. The PDF files (.pdf) are saved in Adobe PDF format and can be opened with the Adobe Acrobat Reader. Alternatively most other PDF readers can also be used, for example the PDF-XChange Viewer and the Foxit Reader. The PDF files can also be scaled up and down so they can be printed on paper sizes other than A4 (eg. enlarged to A3/A2 or shrunk to A5/A6; see instructions). 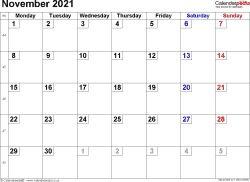 All calendars are blank, printable and macro-free and may be used free of charge for non-commercial use (for commercial use please contact us). The Excel & Word templates can be edited and adapted to suit your exact requirements. Not for commercial distribution or resale. 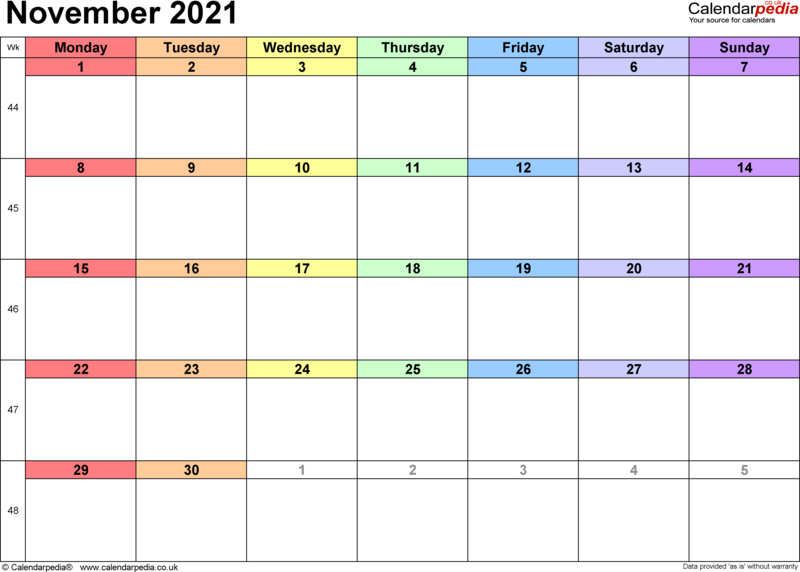 All content of this website is copyright © 2011-2019 Calendarpedia®. All rights reserved. Data provided 'as is' without warranty and subject to error and change without notice. 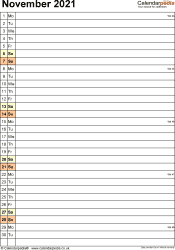 The templates are also available as US version (in US letter paper size, with US federal holidays and weeks starting on Sunday). January · February · March · April · May · June · July · Aug. · Sep. · Oct. · Nov. · Dec. 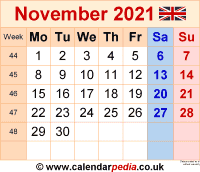 There are no bank holidays in November 2021. 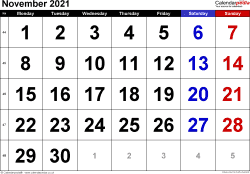 We have many more UK calendars for 2021 in Word, Excel & PDF formats to download and print.